I spent all day Saturday in a blaze of creative fire. Somehow the idea had floated across my field that I should start a podcast. Don’t ask. It doesn’t matter. What matters is that I was completely immersed for a good eight or nine hours in a project that had no real direction, no identifiable outcome, no end game. It reminded me of the time when I was ten and decided that I needed to organize an art contest (I cannot draw), or the time when I found myself embroidering tiny flowers on little squares of cloth, old diapers my aunt didn’t need anymore, one after another. I didn’t know why or what for. I just kept going. Sometimes, not often, but sometimes I am gripped by this force, and I have learned not to question it. No, that is a lie. In the moment, it doesn’t even occur to me to question it. It’s as if nothing else exists except that one thing, that one tiny flower. I don’t question the wisdom of an art contest for non-drawers or embroidering delicate flowers on coarse (and much pee-ed on) cotton. I just do it. This surprises my left-brain-dominant self. Even in my most challenging moments, the middle of an argument, walking to my car late at night, . . . I always know where I am. It’s as if I can split my consciousness between “now” and “meta” at all times. At most times. But not when I am consumed by the creative fire. All else fades away, including (and especially) any notions of “goal” and “purpose” and “result.” I’m in a primeval space where all that matters is the doing, the creating. I imagine the Orion nebula (swirling around) carefully tending her baby stars, oblivious to the speculation, to the armchair quarterbacking. Nothing else matters but the doing. I am reminded of something I heard recently on The Unmistakable Podcast (okay, so the synchronicity doesn’t escape me). Jonathan Fields, founder of the Good Life Project, was talking about his mother, an artist and potter, spending her days throwing clay into beautiful shapes and then firing them in a kiln to finish each object. He talked about how the firing process, the final step, was rather imprecise. Traditional kilns are large oven-like structures whose temperatures are estimated using a rather primitive system of pyrometric cones. The way this works is that these cones, also made of clay, are placed in the kiln to estimate the temperature reached in the kiln at that particular location (yeah, different parts of the kiln reach different temperatures–nice right? Try that when cooking your Thanksgiving turkey!). You have different cones that represent different kiln temperatures. For example you can get 2000 F cones or 1500 F cones etc. When the cone bends, the kiln has reached that particular temperature. Okay, okay, stay with me, now. There’s a reason for all this chemistry. As you can imagine, there is a random element to this final step in making pottery. Fire a pot in a kiln that’s too cold, and it could end up dull and colorless. Too hot, and it could explode. 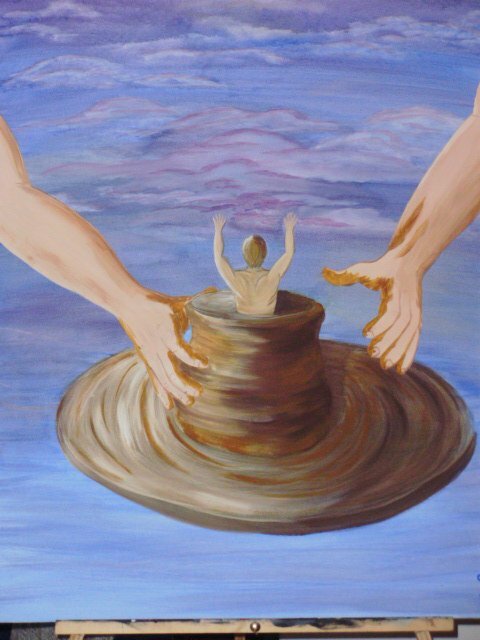 The potter, then, must do the work while simultaneously letting go of the outcome. The artist knows this already. S/he paints, s/he sculpts, s/he embroiders tiny flowers . . . oblivious to their purpose or beauty or success. This morning I woke up myself again. I have papers to grade, laundry to put away, a fridge that needs restocking . . . . I wonder when they’ll come again, Les Nymphes.